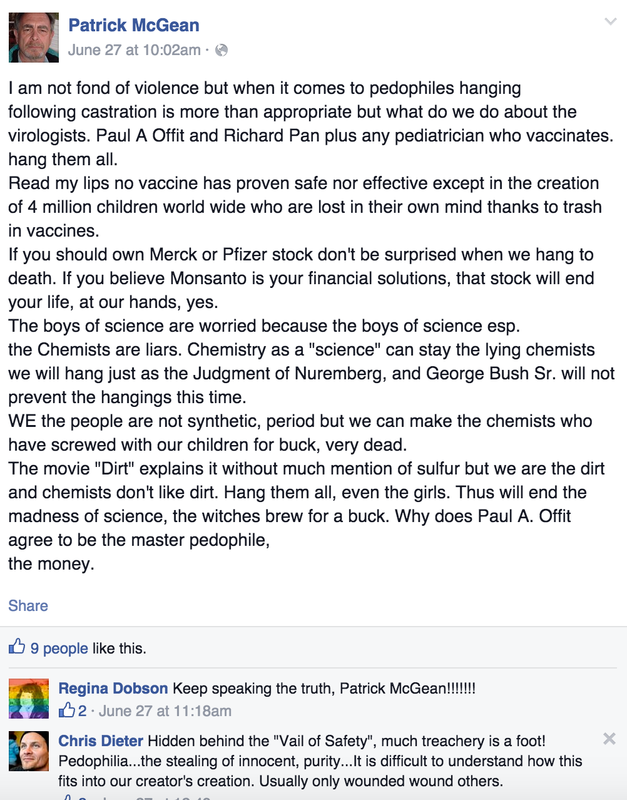 Patrick McGean is someone who needs help. Let me tell you why, then I’ll show you why. “While researching this cancer, it became obvious that the sulfur cycle plays an important role in the regeneration of our cells. The Study also found that the use of chemical fertilizers had effectively broken the sulfur cycle in countries that use these fertilizers. Never mind that deaths from cancer overall, and cases of some cancers in particular are going down. When it comes to snake oil salesmen, they don’t care about no truth. 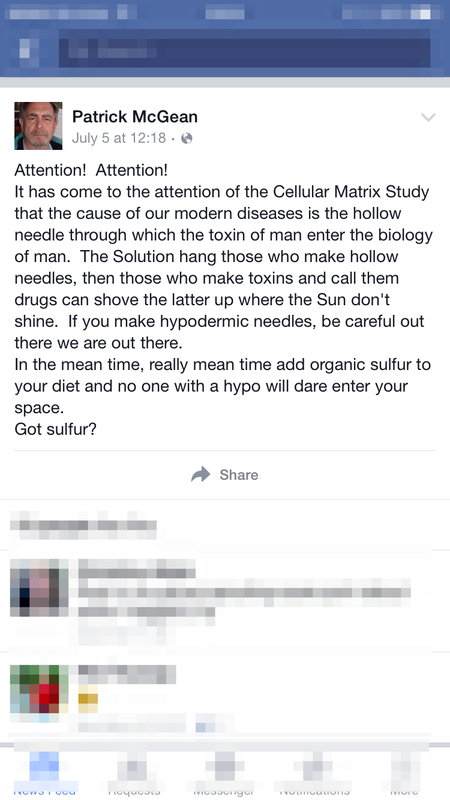 “The main hypothesis of our Study is that we all may be sulfur deficient. What we are trying to demonstrate is that by adding sulfur back into our diet we can allow healthy cellular regeneration to occur through the enabling of oxygen by sulfur. Sulfur is necessary for our bodies to make many of our amino acids and proteins. The function of the cell membrane is dependent upon the proteins and peptides in these membranes that allow the transport of nutrients and gases across the membrane. When these proteins and peptides are diminished the cell membrane become aplastic and leathery forcing the cell to undergo anaerobic metabolism, acidosis or fermentation are examples of unhealthy cellular metabolism and result in cellular degeneration. When cells are allowed to regenerate after years of being scarred or damaged we believe this is an example of how cellular regeneration can be reactivated and some of the examples of neurological regeneration may be the most impressive. Yep. He just takes photographs of faces. If old scars clear up (as scars do), then he claims it’s the “organic sulfur” the suckers participants are taking. Is there an institutional review board overlooking this “study”? Nope. Is there a control group? Not that I could find. Have the findings been peer-reviewed? Negative. But that’s not what makes Mr. McGean someone who needs help. 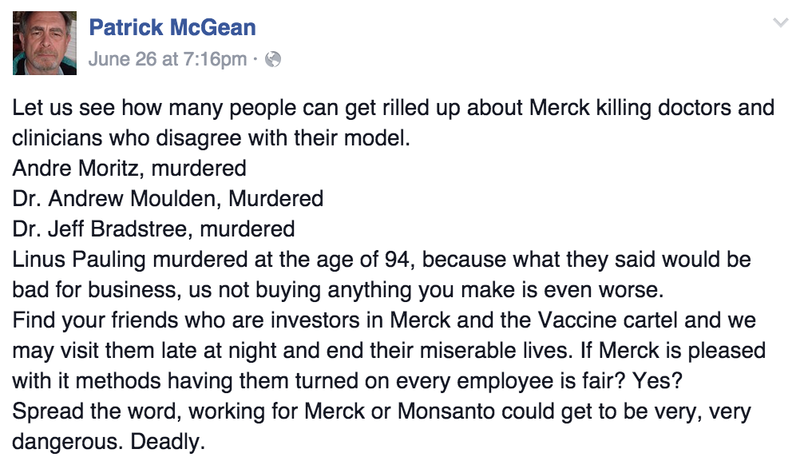 I’d like to say that Mr. McGean is just kidding, just carrying on, or just venting. But I worry that he is not, especially in light of recent credible threats to California lawmakers who passed Senate Bill 277. 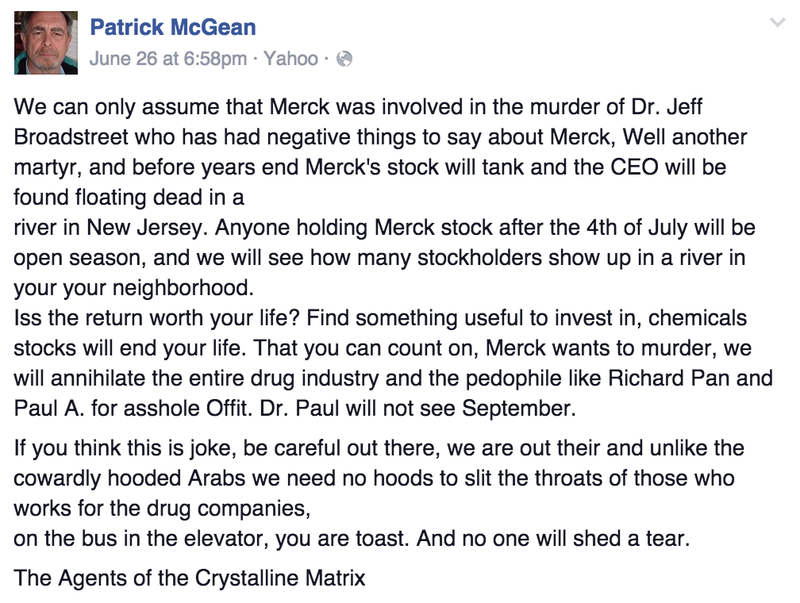 I really hope Mr. McGean gets the help he seemingly needs to desperately. UPDATE: Here is what Mr. McGean had to say about this blog post. It’s a threat of violence if I’ve ever read one. can do anything you wish even damage children for 30 pieces of silver. laws so they can have access to our biology for rather insidious intentions. pedophilia and our children are OUR Children, not yours. there and all describe similar neurological issues Dr. Paul describes it as mimicry. by the kind killers at Merck. By the way we don’t play, is today a good day to die? impossible. Do the math somebody is lying and I speak to the mothers. 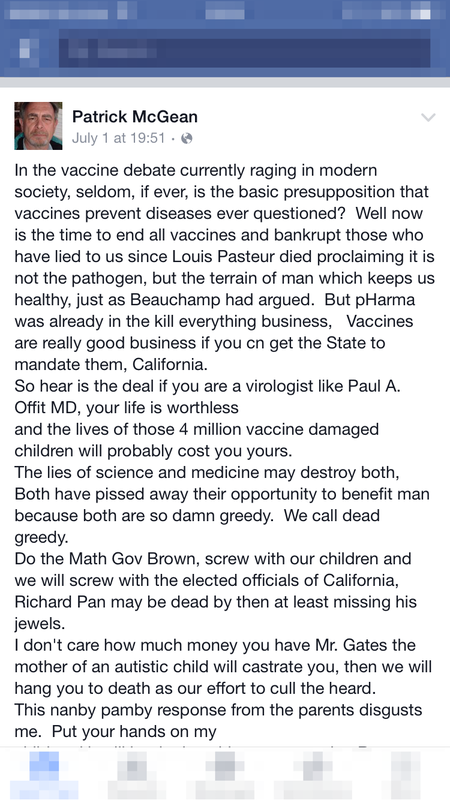 someone else other than Dr. Offit, Dr. Pan or even Gov. 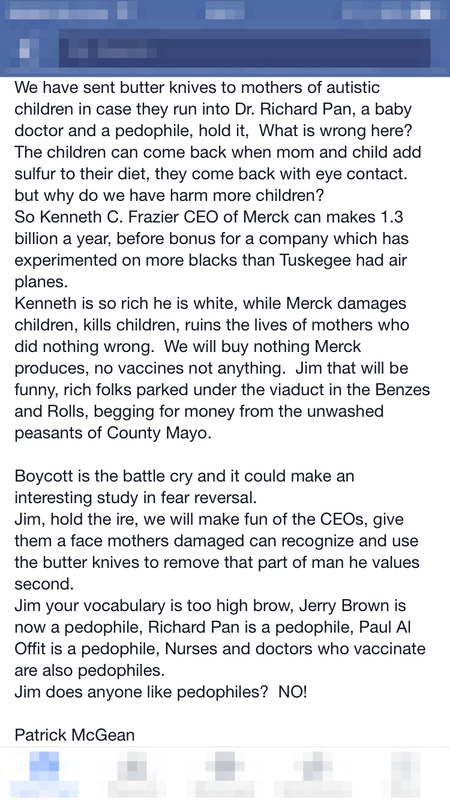 Jerry Brown. What kinds of threats are these? 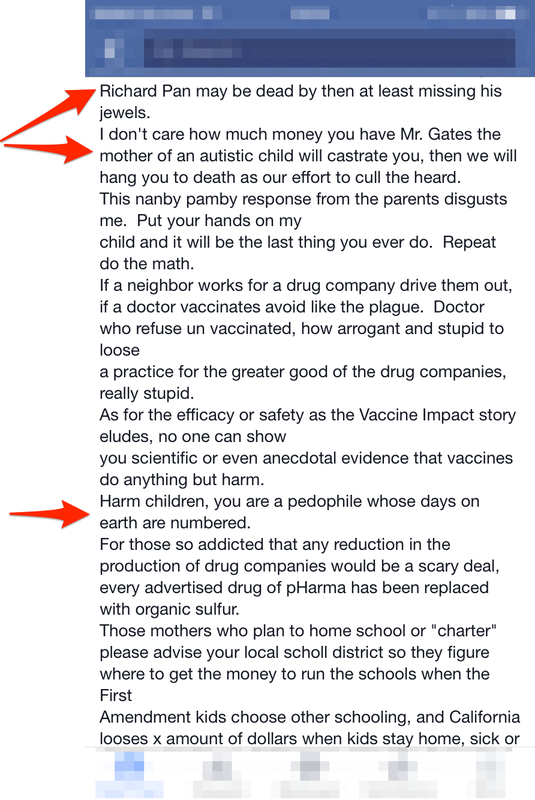 Remember a while back when an anti-vaccine activist called and harassed a pro-vaccine person, even going as far as cynically stating, “You do know hows these things work, these threats work, right?” Well, they’re at it again. Well, it has happened again. It’s a different person making the threats this time, but it’s the same kind of call. 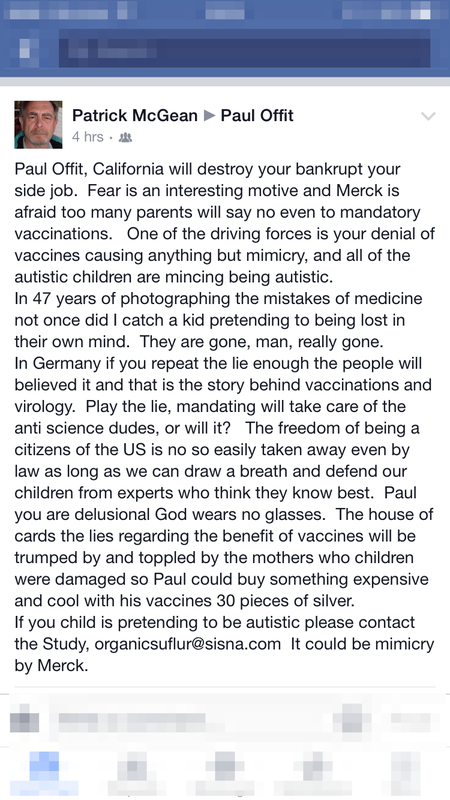 The caller calls the pro-vaccine advocate and threatens to disclose home addresses and phone numbers if the vaccine advocate doesn’t just up and quit their work. What follows are the transcripts of the calls, and then I’ll post the links to the audio so you can hear for yourself the level of vitriol in the messages. It’s really rather creepy to listen to, but these are the things I do for all 12 of you readers. 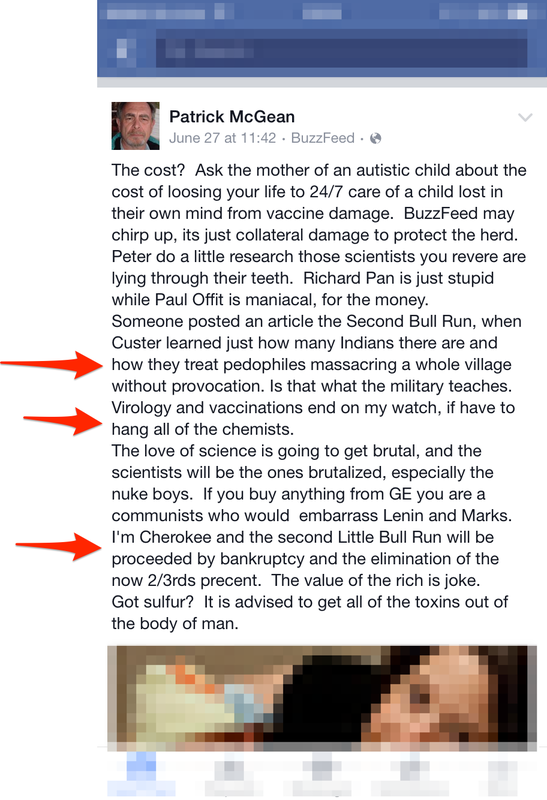 Anyway, the vicim in this case is Dorit Reiss, professor of law and someone who has been very vocal in her refutations of anti-vaccine tropes. Again, I won’t link to the audio file because it has all that information. One of the most worrying things about this call is that the woman caller seems very, very angry and there are children in the background. This woman is exhibiting this behavior in front of children. Keep that in mind as you read on. Calls #1 and #2 happened on the same day. Call #3 below happened five days later, after Dorit wrote something that didn’t please the caller. The call then ends with her making some sort of a mouth noise. It’s as if she was reading a script and went off of it, or she got very frustrated. So how did I get these messages? I got them after a long conversation with Prof. Reiss. She is hesitant to do anything about it since most of these types of calls are just from frustrated people who see monsters under their beds. But I explained to her that these kinds of threats need to be brought to light to show anyone even remotely listening to these people the kinds of people we’re dealing with. This is not normal behavior. This woman on these calls needs help, and, if she is reading this, I encourage her to get that help immediately. There are plenty of mental health therapies that can help with her persecution complex, and there are plenty of organizations who can take care of her children before she hurts them. The biggest piece of evidence of this person needing help is that she genuinely thinks that releasing information that is easily attainable is some sort of threat. It’s as if I told you right now that I was going to release your IP address from where you are reading this blog post. What kind of a threat is that? Well, it’s all in the context. Some whacky “animal rights” activists and anti-abortion activists have released private home addresses and information to their followers in the hopes (and sometimes the direction) that their followers do something with the information. The results have been anything from vandalism to murder. Once this woman comes through on her promise, because Dorit will not stop (and neither will any of us), we will know who she is and what kind of direction she’ll give anyone who listens. So let this be a public record of these threats, and, yes, let’s see where it goes from here. UPDATE: The links to the audio files have been downloaded too much and google is throttling back. If you upload them to your own shareable space (dropbox or google drive), paste the link in the comments so others can hear. Believe it or not, people who are mentally ill are more likely to be victims of violence than perpetrators of violence. This doesn’t make much sense to people because we want to believe that someone who kidnaps, rapes, and murders a person has to be deranged. A “normal” mind can’t possibly do something so horrible, right? Even worse, a lot of people are quick to point out that a criminal — especially a young criminal — was kind of “quirky” or maybe had “autism or something” instead of waiting for the facts to come through on a case. I believe that it’s our own attempt to justify what happened and to tell ourselves that we would never do something like that. Because, deep down, we’re afraid to be monsters ourselves. Don’t deny it. It’s true. Furthermore, autism and other neurological disorders are not mental health problems. You wouldn’t walk up to someone with cerebral palsy and say that they’re “crazy,” would you? Likewise, you wouldn’t say that Muhammad Ali, who has Parkinson’s, is more likely to commit violence than someone who is neurotypical. Would you? Nevertheless, for a very long time, children with cerebral palsy or autism have been treated as being “crazy” or “quirky,” and mass shooters as possibly being autistic (with the implication that said autism was the cause for their violence). It will never stop. We will get to 100% saturation. Every child will be autistic. I’m joking, of course. The prevalence rate will remain the same as it has always been. Our estimate of it will even itself out and approach the prevalence rate and remain there. This is because our ability to do surveillance for autism is improving. The identification of cases by healthcare providers is improving. People with autism are coming forward and demanding to be counted. Our elected leaders are devoting more resources to ways to assist people with autism to lead long and productive lives. These are all good things. What is a disaster is that people who call themselves “advocates” for children and adults with autism continue to say and do things that actually harm people with autism and other neurological disorders. They call it a “disaster” to have a child with autism, or they say that they “lost” their child to autism. They then write that their children are monsters or have monsters inside them. And we’re supposed to just stand back and be understanding because we don’t have children or children who are autistic? We’re supposed to agree that it’s a “disaster” when all rationality says that it’s not and that children with autism can and will grow up to be productive citizens who even appear on CSPAN as advocates of people with similar neurological disabilities? No, we’re not. I won’t. And I hope you won’t either.